Attract birds into your yard to feed from the Whitehall Nuthatch Suet Feeder. This charming feeder features two nuthatches perched on branches, casually observing their surroundings. The branches twist and entangle, forming many small openings for feeding on the suet. These smaller openings also conserve suet under the protection of the large roof. A hammered finish on the roof is echoed in the border around the nuthatch inset, adding an old-world feel to the piece. Two interlocking plates form the suet cage while the lid quickly lifts off the recycled aluminum body for easy cleaning and replacing suet. This recycled aluminum feeder features a durable finish that can withstand harsh elements. As the bronze colored finish is hand-applied, individual color may vary. This feeder may be hung by its built-in hanging ring. Made in the USA. 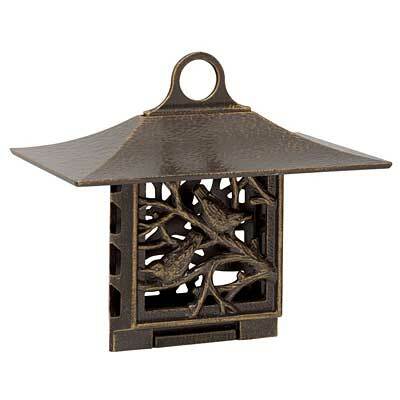 Whitehall Cardinal Nature Hook, French Bronze, 14.75"